The Predators' Shea Weber one of his two goals against the Sabres. Shea Weber and a couple of first-timers helped the Predators snap a home skid. 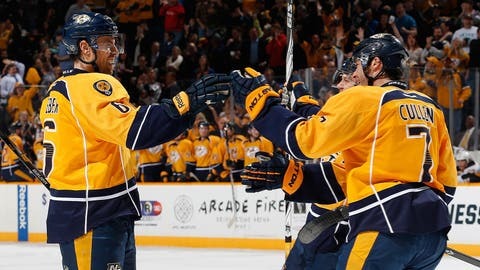 Weber scored twice and Colton Sissons and Calle Jarnkrok each scored their first NHL goals to lead the Nashville Predators to a 6-1 victory over the Buffalo Sabres on Thursday night. Colin Wilson and Eric Nystrom also scored for Nashville, winners of three of four. Rasmus Ristolainen scored for Buffalo, which has lost 10 of its last 11 games. The Predators got off to a fast start, scoring four goals in the first, and ended a six-game home losing streak. "We’ve talked about that the few games that we have to play better at home," Weber said. "We’ve always been a team in the past that takes pride in winning at home and we haven’t done that lately. We need to change that." Sissons scored the game’s first goal at 6:26 of the opening period. From the left circle, Rich Clune sent a backhand on net. Buffalo’s Matt Hackett turned it aside, but Sissons pounced on the rebound at the left of the net and slammed it home for his first career NHL goal. "I can’t really describe it," Sissons said. "I’m on top of the world right now. I’ve been working pretty hard and fortunately got a bounce there to get my first." Wilson struck at 11:44 of the first when he picked up a loose puck in the slot and beat Hackett for his eighth of the season. Just 9 seconds later, Jarnkrok beat Hackett with a snap shot from the slot to record his first career NHL goal. "Jarnkrok was good," Nashville coach Barry Trotz said. "That’s a goal-scorers’ goal. He’s very detailed. I love the way he plays. He plays on the right side of the puck every time." Weber completed Nashville’s first period barrage with a one-timer from the top of the right faceoff circle while the Predators had a 5-on-3 advantage. "Guys came out, and they didn’t come out to play that first period," Buffalo coach Ted Nolan said. "In order to rebuild and retool, you rebuild and retool with the right people." Hackett was removed following the first period and replaced by Nathan Lieuwen. Ristolainen got Buffalo on the board at 2:06 of the second when he beat Carter Hutton with a slap shot from above the right circle. It was the rookie’s second career goal. "It was a goal, but a horrible hockey game," Ristolainen said. He was recalled earlier Thursday from the Rochester Americans of the American Hockey League on an emergency basis due to an injury to Tyler Myers. Weber struck again at 6:19 of the first with another slap shot from the top of the right circle. It was the captain’s 20th goal of the season, the second time in his career that he has reached that mark. NOTES: Wilson’s goal was his first since Dec. 30, a stretch of 33 games . Twelve Predators recorded a point in the first period . Buffalo C Brian Flynn assisted on Ristolainen’s goal. He has assists in two of his last three games . The Sabres are 1-12-0 against Central Division teams this season.